The Karen Teacher Working Group (KTWG) ran a short training for parents of schoolchildren in its effort to raise awareness to get them involved in their children’s education. 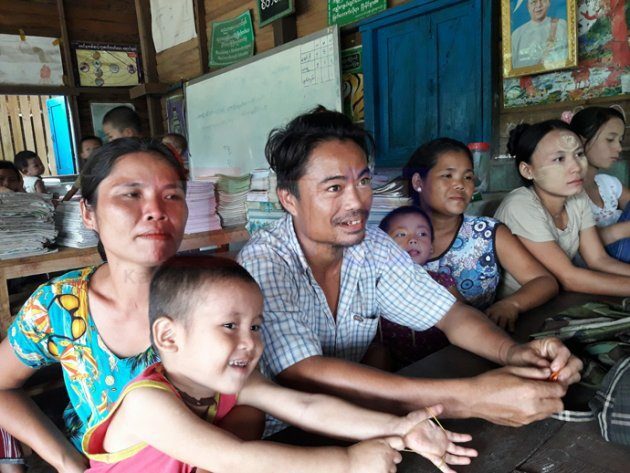 On the 31st of July, two teachers from the KTWG’s Mobile Teacher Training provided a short training course to parents of school children in Chaw Tho Khee (Kyout Hpyar) village, Kyaik Hto Township, Mon state on how to raise their schoolchildren. Teacher Saw Myo Htike, who led the training told Karen News that even though the one-day course, related to Parents Education, was a short, he believed parents gained new knowledge and ideas from it. More than 50 parents attended the course held in Chaw Tho Khee (Kyout Hpyar) village. The short course included teachers explaining to parents on how to divide work and study time with a timetable for their school aged children. There was also a question and answer session where the teachers and the parents discussed the issues around parent education. Saw Lu, one of the parents who attended the course said he would be applying the knowledge he got from the training. KTWG said that even though other courses of training were provided last year in Kyaik Hto Township, this is the first time it included teaching the parents. Following the initial course, it is planned to follow-up in Zee Taw (P’Loh Khee), Hpa Ka Due (Kya Kha’ Hta), and Mar Lar Hpue (Paw Hpaw Lue) villages in Kyaik Hto township. Chaw Tho Khee (Kyout Hpyar) village is a remote village in hill region far away from Kyaik Hto Town and it is in the Karen National Union (KNU) control area. Chaw Tho Khee village tract includes Chaw Tho Khee itself and Maw Paw Law (Moe Baung), T’Waw Thaw (Chaung Saunt New village), Hpoo Hpa Doh (Nat Sin), K’Maut Khwin, Kaw Kat, Htee Wah Klu Khee (Wah Boe Chaung), Tae Dae’ Khee, and Ma Rue Khee (Mae Yone Kyi) village. KTWG provides parent education training with parents on how to raise their schoolchildren every rainy season in Thaton, Taungoo, Nyanglebin, Megui/Tavoy, Mutraw, Doo Playa and Pa-an district – the seven administered districts of the KNU control areas.